One of the most frustrating things about having a wireless controller is the continuous need to keep them charged. This isn’t something that they have on PS4, and my Playstation friends never fail to remind me of that. I tell them that it’s not really an issue. And with the right battery pack, it really isn’t. But to get the best battery pack for your Xbox, you should consider what you can afford. There are a few different options available to you, and it’s worth looking at all of them before making a decision. 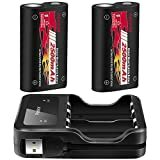 There’s no denying that rechargeable batteries are far better than regular ones, so you should undoubtedly look at getting a set if you’re an avid gamer. Here, I’ll have a look at some of the better sets that are currently available online that you might want to consider. Though they are similar, they do have some differences that might make you prefer one over the other. Ask anyone who’s ever used Eneloop batteries in their xbox controller. Heck, ask anyone who’s ever used Eneloop batteries in any of their devices. After making the switch to Eneloop last year, I’ve since decided that I’m going to use them in all of my devices as they’re so long lasting. Eneloop batteries come in a variety of different amounts – for me, I started by just purchasing 4 batteries and the quick charger pack. This worked well for me, as I was able to give the batteries a run through before debating whether to purchase some more. In the end, the whole house ended up with Eneloop batteries for a relatively inexpensive price (for me anyway, as I’d been guilty of buying regular batteries for a while). In fact, there’s no surprise that Eneloop (created by Panasonic) are some of the best batteries you can buy. Why? Well, they’re even collaborating with Tesla on their car batteries, so they certainly know their stuff. If you’re looking for rechargeables, you don’t need to look much further than this. I know what you’re thinking. How’s the battery life on these? Well, from a full charge you’re going to get a good 20 hours of gameplay from the Eneloops. Not just this, but unlike some other battery brands (not mentioning anyone Duracell) the batteries actually hold up pretty well over time, and you won’t need to renew them for years to come. I haven’t actually tried the Eneloop Pro batteries myself yet as I’d already gone with the originals. But, I did have a friend online recommend them to me the other week. He seems to think that their battery life lasts a little longer than the standard ones, and after reading this post on reddit, it seems to confirm that the Eneloop Pro’s do have a little longer battery time of around 24h. This is ideal, but in all honesty (after doing a lot of research online), I don’t really see the point of purchasing the Eneloop Pro model over the standard Eneloops. The standard Eneloop batteries will retain their charge for a longer period of time than the Pros, and unless you really need them for something specific, I think you’re better off going for the cheaper option. If you’re looking for a more typical battery pack, then Smatree also offer a pretty good deal on a 4 pack of batteries and charger. Although they might not last quite as long as the Eneloops, they do need significantly less charging time – they should be fully charged within 6 hours. The best thing about the Smatree batteries is likely the price – they’re pretty inexpensive. And at this price, you’re getting some decent quality batteries that will undoubtedly get the job done. They’re also a really good set for quick charging. If you’re the type to forget charging (you’re not alone! ), then you can charge this set quickly for 20-30 minutes and get a good few hours of gameplay from them. I also think that the Smatree batteries would make an awesome set if you’re looking for something safe. If you have young kids who might leave the battery pack on, there’s no need to worry – this set stops charging automatically when the batteries are fully charger. 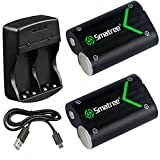 If you’re after an easy to use battery pack, then you may want to consider this Smatree set. --2500mAh high capacity, The playing time more than twice the others. Battery pack could be recharged about 2000 times. Fire-resistant material and strict production procedures help you enjoy game with safety. If you’re looking for batteries that will be fully recharded in a quick time, then these might prove a viable option. The Ponkor batteries will be fully recharged in about 5 hours, which is quicker than most other battery packs on the market. The charger for this battery pack is particularly slim, which means that it won’t stick out from the wall and obstruct and of your other plugs and cables. With other bulkier chargers, this can be a bit of an issue. But, this isn’t the case with these Ponker High Speed Charging Batteries. Another good thing about these batteries is that although they’re one of the cheaper brands, they still have a good warranty. And if you check the reviews online, they do honour the warranty in almost all cases. This means that if your batteries stop working for any reason, you can contact the company and they should resolve the issue for you. You might not want to consider a battery pack – there are also other options available to you online. You can also consider getting yourself a charging station, which will work as well as battery pack (they pretty much work in the same way). Plus, you’ll get somewhere to place your controllers so they don’t get lost in your bedroom! This works for both Elite and standard controllers, so it doesn’t matter which you’re going to use. These kind of charging stations are a good option if you’re looking for the convenience to charge two controllers easily as one. As soon as they’ve fully charged, the light will go from red to green, letting you know that they’re ready to go. They don’t take longer than 5-6 hours to fully charge, and then they should be good to go. Essentially, this is just a battery pack charger with a fancy stand. If you can find it available at a good price, then it’s worth considering. It’s licensed by both Microsoft and Energizer, so you can be sure you’re getting the real deal and not something subpar and cheap. Of course, the same battery pack isn’t going to be suitable for everyone. And, there are some things that may make each battery pack more suitable for you. In all honesty, the first thing that you should factor into the equation is the price of the batteries. Whilst batteries aren’t the most expensive thing in the world, it can pay to spend a little extra than $10 and just get the cheapest set online. Some of the cheaper sets are particularly poor quality, so it’s worth avoiding them and going for something a little better. The benefit of going for big brands like Duracell or Panasonic is that they have great warranties. There’s nothing worse than buying a product, it breaking after 31 days and the company not honouring their warranty. So, you should definitely check the warranty on any battery pack that you’re looking to purchase. One thing that some people forget is that you’ll have to consider the design of your battery pack. Depending on where the plugs are in your household, you may or may not have room for certain battery packs there. They can be large and bulky, and if you want to charge your batteries in your bedroom, then it can get in the way of other stuff or be awkward to put into the wall. Overall, it’s pretty clear to see that for me, the Eneloop batteries are by far the best option for most people. You can use them for an abundance of different things as well as your Xbox, and if you purchase them in bulk, they really aren’t that expensive. A battery pack isn’t the only thing that you should consider if you’re an avid gamer. As well as being money conscious by getting rechargeable batteries, you should also be health conscious too. This means gaming whilst in a comfortable position (consider getting a gaming chair) and for me, getting a good set of gaming glasses has made a massive difference to my sleeping pattern. The reality is that you should do your own research before you purchase anything online. There aren’t a lot of differences between these battery packs, but there are some that you’ll definitely want to avoid. You can learn this just by paying attention and reading through the online reviews, however. If you do this, you should be good to go.